Oats have been around for centuries and a bowl of porridge has always been considered a satisfying breakfast. Oats are derived from a weed of the primary cereals wheat and barley. Oats have numerous uses in food. Most commonly, they are rolled or crushed into oatmeal, or ground into fine oat flour. Oatmeal is chiefly eaten as porridge, but may also be used in a variety of baked goods, such as oatcakes, oatmeal cookies, and oat bread. Oats are also an ingredient in many cold cereals, in particular muesli. Oats are composed mainly of carbohydrate but compared to other cereals they contain higher levels of both protein and fat. They provide useful amounts of the B vitamins like folate, minerals like magnesium, calcium, iron. Including oats in your diet provides a wide range of important health benefits. Oats have a low glycemic index which means they are absorbed into the blood stream slowly helping to keep blood sugar levels stable. Beta-glucans, a soluble fiber which has proven effective in lowering blood cholesterol is present in oats and hence can lower the chances of having heart disease. Because of the high fiber content present in oats, they are said to be helpful in preventing constipation. They contain a good balance of essential fatty acids, which have been linked with longevity and general good health, and also have one of the best amino acid profiles of any grain. Oats can slow down the digestion process and provide an extended sensation of fullness. This makes them good for people who want to lose weight. Having oats for breakfast will reduce weight. No single food can reduce weight. Following a well balanced diet and exercising regularly is the best way to reduce weight. Oats should be avoided for children because it is difficult to digest. Oats can be eaten by people of all ages. Children too are able to digest the soluble fiber that's present in oats. 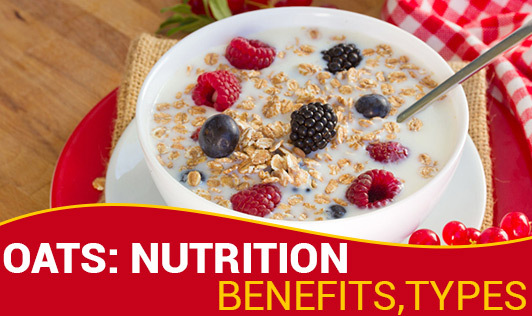 All the benefits mentioned above are actually for oats. Most people don’t think about oats – they think about oatmeal. In fact most people could not identify whole oats if they were sitting in front of them. There are many different levels of processing of oatmeal. Generally the larger the “flake” – as in rolled oats or the bigger the seed or groat – as in steel cut oats – the less processed it will be, the more nutrients it retains and the slower it will be to digest. It will also be slower to cook though. Most people think steel cut oats are the least processed since that is how the largest groats are labeled, but some of the most processed oats like instant and baby are also steel cut. Add a tablespoon of oatmeal to curd for a fiber boost. Oats make a tasty crispy coating for chicken, or fish; simply dip in egg white, coat with oats, then bake in the oven. Use oats to make porridge or add to soup, stew and salads. Replace up to 1/3 of the flour in recipes with oat flour.